Q:Can you tell me if you use real champagne and what kind and is the price $29 for 6 lbs? A:These gummy bears are infused with champagne, though not considered to be alcoholic. Correct, the pricing for the 6.6 lb bag is $29, however until October 31 there is an additional $18 cooler fee. 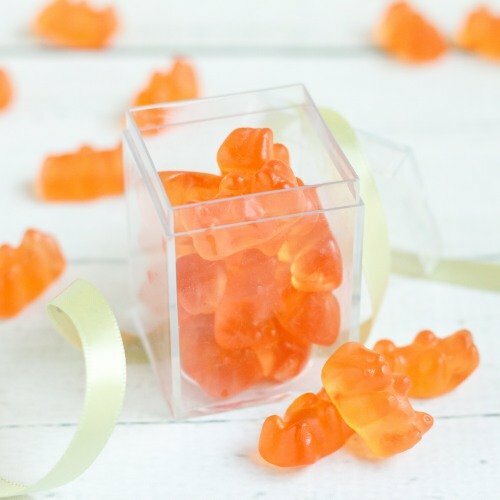 Treat your party guests to these delicious champagne gummy bears! Each bag comes with 6.6 pounds of gummy bears that have been flavored which just the right amount of champagne. Fun and sweet, your guests won't be able to resist! Also great for bachelorette parties and bridal showers.